British Prime Minister Theresa May leaves 10 Downing Street in London, to attend Prime Minister's Questions at the Houses of Parliament, Wednesday, Feb. 27, 2019. May insisted Wednesday that Britain will leave the European Union on schedule next month, while the head of a major business organization said May's grudging decision to allow lawmakers to vote to delay Brexit provides an "option on sanity." 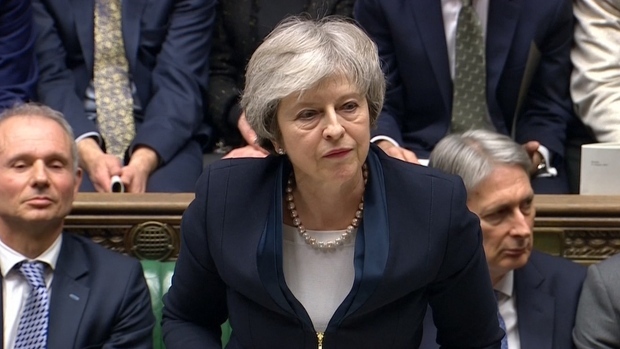 Prime Minister Theresa May insisted Wednesday that Britain will leave the European Union on schedule next month, amid signs that her promise to give Parliament a vote on delaying Brexit was boosting support for her unpopular EU divorce deal. May has bowed to pressure from within her Conservative government and given Parliament the chance to delay Britain's scheduled March 29 departure if lawmakers fail to approve her divorce agreement with the bloc. The change of course was welcomed by pro-EU members of Britain's divided Parliament, who sought further guarantees the government would not try to renege on May's commitment. Lawmakers in the House of Commons voted 502-20 in favor of a symbolic motion underscoring May's promise. Some pro-Brexit lawmakers, who fear delaying Brexit day could be used to try to stop Britain's withdrawal altogether, abstained from the vote. 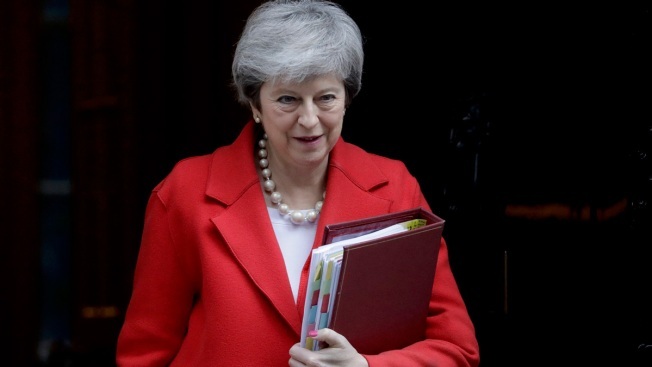 On Tuesday, May gave Parliament a greater say over Brexit to forestall a rebellion by pro-EU members of her government, who threatened to quit and vote with the opposition in order to rule out a disruptive "no-deal" Brexit. She said Parliament will get to vote again on her deal with the EU by March 12. If it is rejected, lawmakers will then vote on whether to leave the EU without an agreement or seek to postpone Brexit by up to three months. 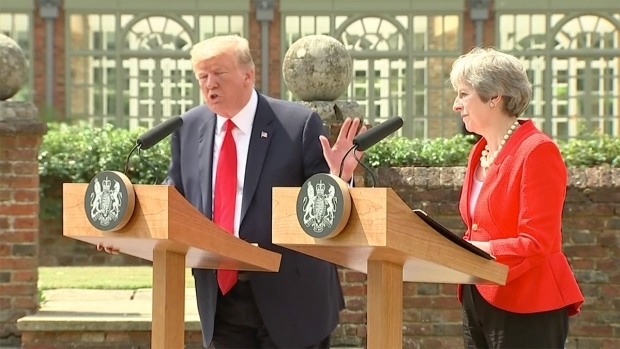 May stressed that she personally opposes extending the Brexit deadline, and said "the United Kingdom remains on course to leave the European Union with a deal" if lawmakers "hold their nerve." Writing in the Daily Mail, May said talks with the EU about securing changes to the divorce deal to make it more palatable to Parliament have "begun to bear fruit." The House of Commons rejected May's deal with the EU by a huge margin last month — largely over concerns about a provision to guarantee an open border between the U.K.'s Northern Ireland and EU member Ireland — and sent May back to Brussels to get changes. The EU is adamant that the legally binding withdrawal agreement can't be changed, though the bloc's negotiators are holding talks with U.K. Attorney General Geoffrey Cox about potential tweaks or additions to reassure pro-Brexit British lawmakers that the border "backstop" is only a temporary measure. May is calculating that the prospect of a delay may persuade pro-Brexit lawmakers to support her deal despite their reservations. Many Brexiteers feel the Irish backstop portion of the deal keeps the U.K. bound closely to EU trade rules, unable to strike new agreements around the world. Brexit-backing Conservative lawmaker Edward Leigh said Wednesday that colleagues should back the agreement because "the choice is no longer perhaps between an imperfect deal and no deal — it is between an imperfect deal and no Brexit." Lawmakers rejected a bid Wednesday by the main opposition Labour Party to force the government to embrace its alternative Brexit plan, which calls for retaining close ties with the EU. Labour has said if it can't get its plan through Parliament, it will campaign for a second referendum on Britain's EU membership. The government caved in on a vote it looked set to lose, agreeing to guarantee the rights of EU citizens living in Britain whether or not the U.K. leaves the bloc without a Brexit deal. "That such an amendment is needed is in itself a very sad state of affairs," said Alberto Costa, the Conservative lawmaker behind the motion. He said 3 million EU citizens in Britain and 1 million U.K. citizens in other EU countries "should never have been used as a bargaining chip. British businesses welcomed the prospect of a Brexit delay. They warn that without a deal, Britain risks a chaotic departure that could disrupt trade between the U.K. and the EU, its biggest trading partner. 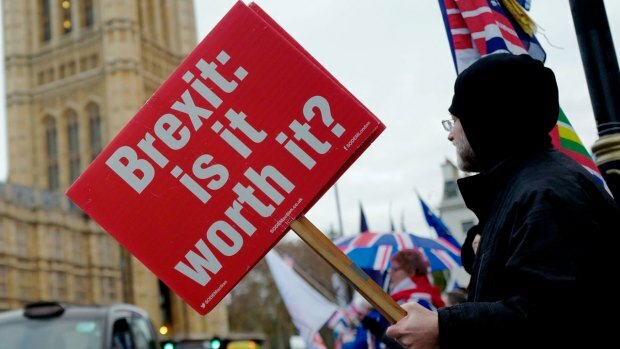 Confederation of British Industry head Carolyn Fairbairn said leaving without a deal would be "a wrecking ball on our economy" and giving the option to delay "feels like an option on sanity." Delaying Brexit would require approval from all 27 other EU countries, whose leaders are annoyed by what they see as the inability of feuding British politicians to agree on what kind of relationship the U.K. wants with the bloc. Chief EU Brexit negotiator Michel Barnier said Wednesday that there must be clarity that extending negotiations wouldn't just prolong the impasse facing both sides. EU politicians say Britain must have a good reason for seeking a pause. French President Emmanuel Macron said any such request would need to be justified by "a clear perspective on the goal." "We don't need time. We need decisions," he said at a joint news conference in Paris with German Chancellor Angela Merkel. Merkel said the EU wouldn't refuse Britain "a bit more time." She said "we are aiming for an orderly solution — an orderly withdrawal by the British from the European Union."